This Deck article was written by openCards user Jaxander at Dec 26th, 2009. You can not have Hero AND Villian cards in you deck (all cards must correspond to you character and must be either Hero OR Villian)! I haven't tried it since I've added the set THREE cards to supplement Mr. Blonde, but if there was one thing I noticed with him, it's that he's not generating enough Energy through his normal card usage, and that my original deck didn't feature enough buffs for the side Skirmishes, relying solely on tying the sides and winning the center. A bit too risky for me, so I revamped it. 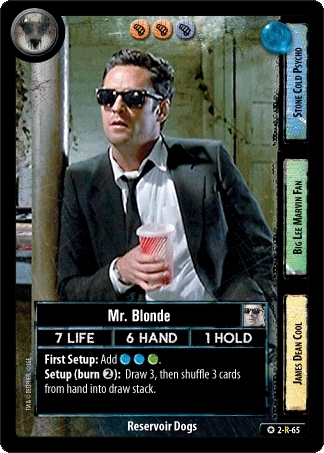 I use cards like Whatever It Takes and Investigation to add to Mr. Blonde's energy generation. And since Whatever It Takes requires you to destroy your own gear or condition, I have three Cocoons and one Otis B. Driftwood in there to help it along. Cocoon is a nice gear, adding +1/-/+1, but if used in conjunction with Whatever It Takes, it will generate two energy of any color, something Mr. Blonde can use a lot of. Otis is nice to buff your Fate skirmish, or to increase your Hand/Hold, but he will also net you an additional 2 of any Energy color. And then I use that extra energy to go Effect heavy. I use Fingered to its full extent by discarding two cards from hand to make my fight +2/+2/-, and I'm not afraid to go overboard on destroying my own Support Row because Mr. Blonde has plenty of cards to cycle them right back in (such as Acting Like a Professional and Bark All Day). If anyone has any advice on a Mr. Blonde deck, please post it. Otherwise, next time I see this one in action, I'll let you know how things played out. EDIT: I just noticed, after I posted this deck, that the Effect "Fingered" from set THREE is a T-1000 Signature Effect, and cannot be used in this deck. I'll poke around and see what else I can stick in there for similar effect.